Beyond Salmon: Does my blog look good in this? I guess so! Does my blog look good in this? I guess so! I particularly love Fred’s photo of winter fruit compote. 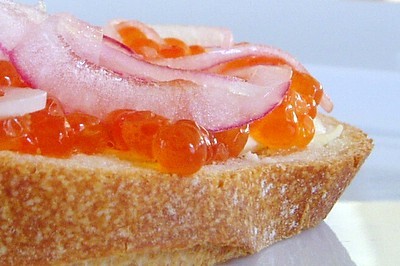 What was surprising is that my photo of caviar got a joint Aesthetics award. Wow – I am blushing as I type, and am honored to be in such great company of Belly Timber and Lucullian Delights. By the way, I promised you guys the menus from my Russian and Provencal classes. I really like your photo, the light and the textures are great! Very very nice! It really is a lovely photo! What a great picture, the colours are beautiful, well done!! Congratulations! It does look good! They all do!